หูฟัง Meze 99 Classics ให้เสียงที่เป็นธรรมชาติอย่างที่สุด ถูกสร้างมาเพื่อนักฟังที่รักเสียงเพลงหรือนักฟังที่พิถีพิถันกับคุณภาพอย่างที่สุด วัสดุที่ใช้สร้าง 99 Classics ได้รับการคัดสร..
Empyrean is the product of two passionate companies coming together to explore what is possible beyond their individual capabilities. The result is a no-compromise headphone embodying Meze’s daring aesthetic and user-centered design approach and Rinaro’s experience in research and development within the field of planar magnetics. Rinaro, a progressive audio company, has at the heart of its technology an R&D team that has been at the forefront of planar magnetic development since the 1980’s. What originally started as a state-funded initiative with a focus on innovation has now entered into a new chapter of audio progression with the opening of a cutting-edge industrial facility in Ukraine. having 4650 mm² of active area. Symmetrically placed on each side of the diaphragm, our neodymium magnets are specifically arranged into a Hybrid Array to create efficient Isodynamic magnetic field required for a uniform activation across the whole diaphragm surface. Combines two independently shaped voice coils within the same diaphragm delivering more selective acoustic performance to the various areas within the structure of the ear. One of the problems with conventional planar magnetic arrays is coming from reflected signals entering the ear canal with different time delays, thereby worsening the focus of 3D sound imaging. Combining different voice coil configurations makes it possible to create a better sound intensity distribution across the sound wavefront at high frequencies when directed at the auricle and ear canal. The spiral coil is more efficient at reproducing middle-high frequencies and is positioned directly over the ear canal enabling more direct sound waves to enter the ear without any time delays. An innovative feature is the Isomagnetic® ear cup attachment which utilizes the demagnetizing field generated by the driver to hold the ear cup in place whilst also redirecting the magnetic field back into the driver and improving driver efficiency. 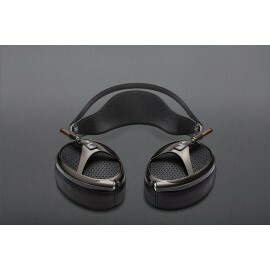 The ferromagnetic ear pads decrease the magnetic stray field affecting the listeners head. Patented ferromagnetic plates channel the magnetic field back into the driver, increasing output. Innovative use of the magnetic field of the drivers to fix the earcups in place. Patented ferromagnetic plates channel the demagnetizing field back into the driver increasing efficiency by 1db or 12% and deflect 95% of stray fields away from the head. Each driver has been hand assembled and tested in an industrial facility in Ukraine. Patented suspension wings increase the leather headrest’s contact surface area with your head and relieve uncomfortable pressure points. CNC milling time: ≈20 hours. and is a work of art in its own right. 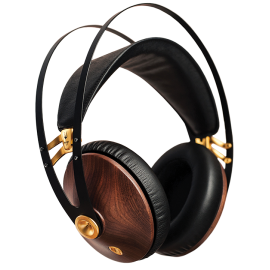 For the audiophiles who want to hear how 30 years of progression sound like, Empyrean pairs the advances in audio reproduction with a headphone chassis that delivers extended hours of listening pleasure. We carefully hand assemble each headphone in our facilities in Baia Mare, Romania. A core belief of Meze is to create products that last. The Empyrean is no different: from the replaceable earpads to the high-performance materials used, every part on the headphone chassis is available to be serviced and disassembled by our skilled team. Rinaro, Isoplanar, Isomagnetic are the registered trademarks of Rinaro Isodynamics Limited. “Empyrean was born from passion, curiosity and innovation. As a business, we have allowed ourselves the freedom to experiment and take risks in search of the perfect sound. To generate somethin..